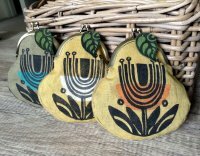 Another design for my lino print linen purses - this time a flower, printed in black with a splash of added colour behind the main image. I'm now working on a new design - a mouse wearing a jumper! Not sure how this one will turn out, but he will be making his appearance here at some point, once I get time to finish him!